New York, NY- Le Poisson Rouge, located at 158 Bleeker Street, New York NY, is proud to present a Nepal Relief Concert featuring some of the most esteemed names in jazz. The concert will begin at 7:00 PM and run until 11:00 PM. The cost to attend is $25 and $15 for students with ID. All proceeds will be donated to UNICEF and Handicap International. Reservations can be made online by visiting www.lepoissonrouge.com or by calling (212) 505-3474. 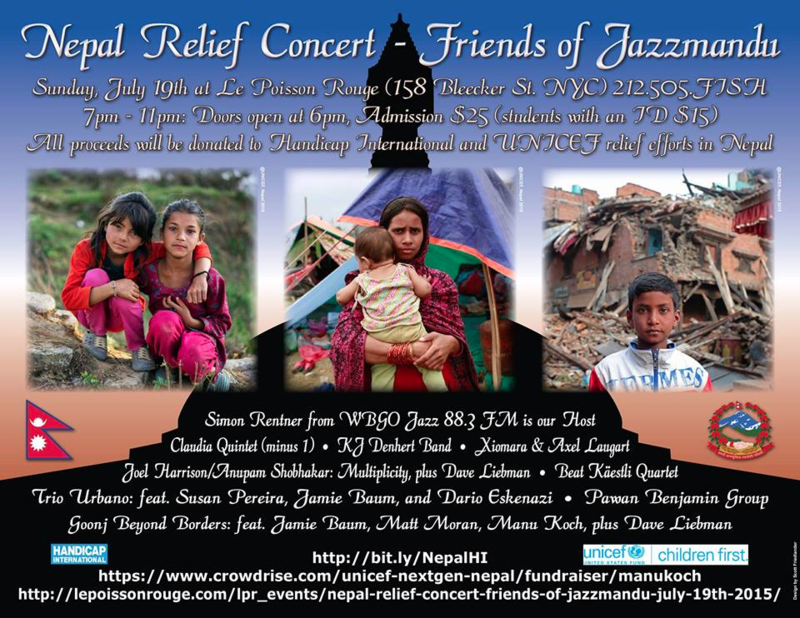 Following the catastrophic earthquake in Nepal, flautist Jamie Baum, Manu Koch and others resolved to organize a benefit concert, and in consultation with the founder and organizer of Jazzmandu, Navin Chettri, reached out to bands who had performed at the festival as well as other allies in the jazz community. The night, hosted by WBGO’s Simon Rentner, promises a wide variety of delights: the ever-intriguing compositions of Claudia Quintet; KJ Denhert’s funk and soul, Joel Harrison and Anuparm Shobhakar’s mix of North Indian classical music and jazz; Goonj’s earthy Indian-based groove music, Beat Kaestli’s French-flavored jazz vocal; Pawan Benjamin’s visionary saxophone immersed in Nepalese traditions; and the renowned mother/son Laugart team leading their Cuban quartet. These eight bands, five of which have performed at Kathmandu Jazz Festival (Jazzmandu), will perform for approximately twenty minutes each. Two bands will feature jazz legend Dave Liebman, honored guest on soprano saxophone. Liebman hast listened to and been inspired by Indian music since the 1960’s and has played on the continent several times with his own bands.